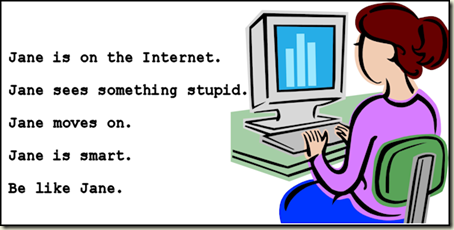 Geeky Bob | Just a short, simple blog for Bob to share his thoughts. 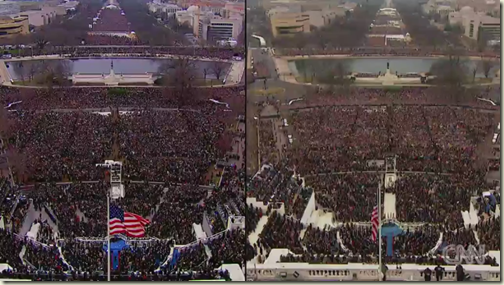 This is a perfect example of "Fake News" in action; the two photos in this image are taken from opposite sides of the mall in order to exaggerate the crowd sizes. 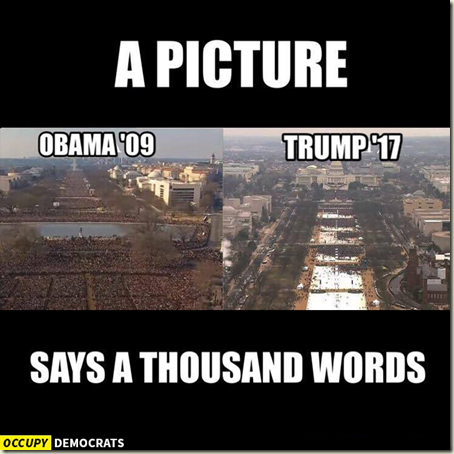 In addition, there is no indication that they were taken during the same hour of the respective inauguration ceremonies; the photo from 2009 might be an hour after the ceremony began, and the photo from 2017 might be an hour before the ceremony began. We have no context, but considering the source (the O.D. 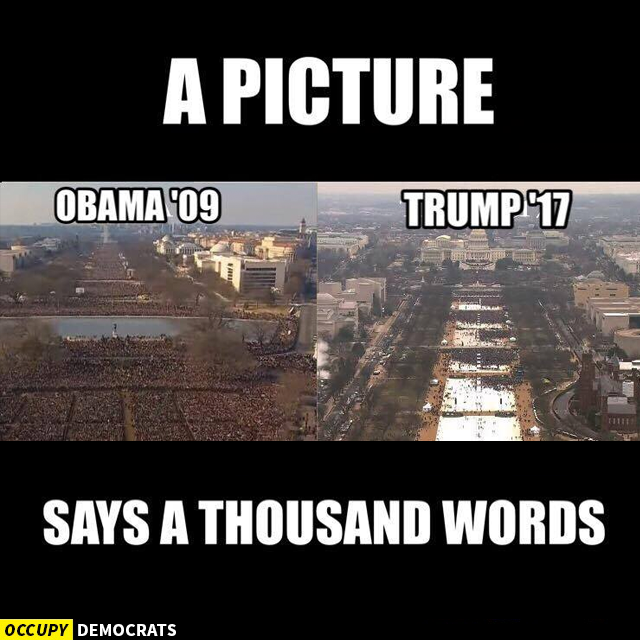 website) and the fact that the photos were already falsely utilized in order to support an opinion rather than an accurate portrayal of the facts, it's pretty easy to dismiss this image. And yet, I have seen dozens of people posting this image to Facebook with comments of overwhelming approval. 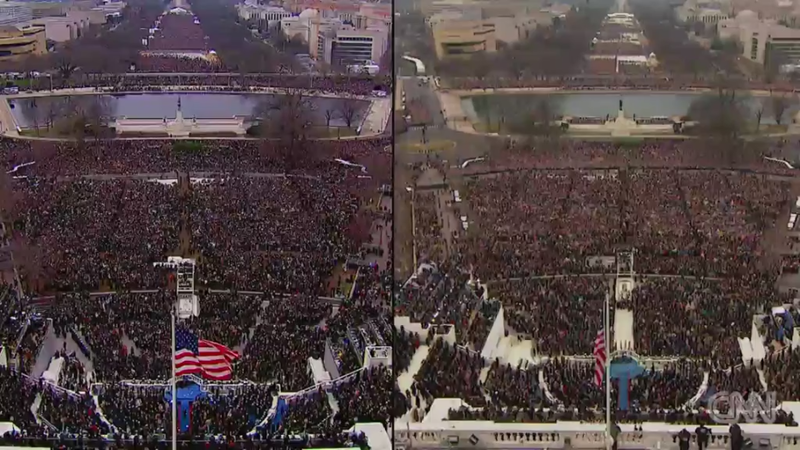 It is evident that there was a larger crowd for Obama's inauguration, which is as it should be; the nation's first African American president is considerably more-significant to history than Trump's election. However, the disparity was nowhere near the level of imbalance which that "Fake News" image was trying to convey. Returning to my earlier point, this particular example of "Fake News" perfectly illustrates why the acceptance of these sorts of deliberately inaccurate images and stories do so much damage; these hoaxes replicate like viruses through social media, and they rapidly enter the collective psyche of those who eventually believe that these images and stories are true simply because they want them to be. This where another new term needs to be defined: "Post-Truth," which describes an all-too-common situation where opinions are formed and defended based on emotions rather than factual evidence. Through honest self-examination, I think everyone can agree that we have all let our emotions get the better of us, (on more than one occasion), and we have all agreed with something simply because we wanted it to be right, even when common sense would argue otherwise. This philosophy led to a situation which was all-too prevalent during the election: everyone who was passing along inaccurate information created their own false reality, with which many of their friends actively participated, and yet no one was anywhere near the truth. After the election this syndrome was referred to as an "Echo Chamber," where people were simply hearing others repeat back what they said or wanted to hear. One such example was the poll numbers which everyone kept sharing on social media, which always seemed to indicate that Clinton would win the electoral college by a landslide, and yet on election day she lost the electoral college in a humiliating defeat. Of course, the 24x7 news coverage from all of the media outlets added a never-ending supply of fallacious data to the debate, but still - there were plenty of indicators that the election was a lot closer than the false narrative which everyone kept repeating; people just needed to take the time to look. Nevertheless, we should all try to do better where "Fake News" is concerned. As a general rule, if you see something which seems too good to be true - or too bad to be true - please check with other news sources before posting anything to social media. There are many more, of course, but it's a good place to start. 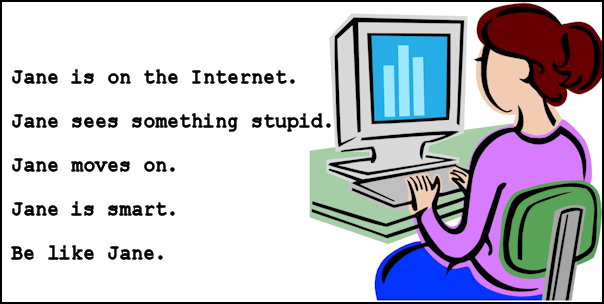 There are hundreds of thousands of stories just like this on the Internet, so don't believe everything you read. Two years ago I wrote a post which was titled Anti-Vaxxers are Idiots, in which I explained in great detail how important it is for people to be vaccinated and to vaccinate their children. So it came as something of a depressing surprise for me to witness another needless debate fueled by ceaseless drivel from uninformed conspiracy theorists who still cling to the long-disproved belief that vaccines cause autism and other maladies. I am simply amazed at the level of denial from most of these people; it's like they belong to the "Flat Earth Society." Nevertheless, these fools are most-likely alive and healthy and able to voice their misguided opinions only because previous generations were vaccinated sufficiently enough to halt the spread of diseases which would otherwise have killed the parents or grandparents of these naïve nitwits. Despite any protestations to the contrary, vaccines stop diseases. Period. If you deny that fact, then there is no other way for me to put this - you're just an idiot. I wish that I could put that nicer way, but that's just the way things are. However, because someone was positing the theory that vaccines are ineffective since occasionally some people still get sick, I thought that I should point out another point of truth: sometimes a vaccine doesn't just lessen the chances of contracting a disease, sometimes it lessens the severity of the disease. Here is a true story: during my time in the Army, all of the soldiers were forced to have flu vaccinations every year. This decision was passed down from the Pentagon because diseases run rampant throughout the military, which is due to the deplorable conditions in which we had to live in order to do our jobs. (See the 1918 Spanish Flu Pandemic for an example.) In any event, there were several years when I was vaccinated and I still got the flu, although I was over it after a day or two. So when I left the military, I decided to stop having my annual flu shot. However, two years later I contracted the flu during another domestic outbreak. The illness wreaked havoc on my system for several weeks, and my life was spared only because medicine has continued to evolve over the past few decades since the last devastating pandemic. But make no mistake - 20 or 30 years ago I probably would have died from that strain of the flu. I have learned my lesson, and now I make sure that I get my flu shot every year. Sometimes I still get sick, but never as sick as that year when I skipped my flu shot. 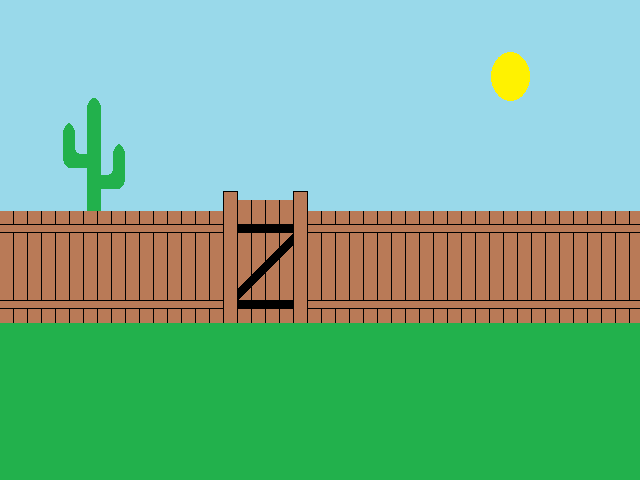 Okay, I have a confession to make - when I was very young, and by that I mean several months younger than the age of two, I was traumatized by the letter "Z." Now I know what you're thinking; and it sounds ridiculous, right? But I knew that the letter "Z" was out to get me - and I had proof. You can see my point, can't you? The letter "Z" obviously had a mind of its own; it had an attitude, it was reckless and passive aggressive, and it seemed to bring out the worst in Kermit the Frog. There was no mistake about it in my mind: the letter "Z" was a nasty character, and it was something which I wanted nothing to do with. And yet, the letter "Z" had somehow followed me home, and it was living in my backyard. I saw it there - every day - lurking just outside the sliding glass door, and watching my every move. But what was even more unsettling for me was the fact that my parents, who were supposed to love me, would plop me down in my high chair and turn it so that I was facing outside. And there I would sit, staring at my nemesis, who wouldn't move an inch. The letter "Z" was sizing me up, and I knew that it was waiting to see if I would fall asleep in my high chair... and then it would attack. So I kept my eyes open, and I never took naps in that house. Oh sure, that meant that I was cranky toddler, but that wasn't my fault; I was a victim of my circumstances, and my parents needed to pay for their transgressions. You can say what you want, but I'm telling you the truth - that letter "Z" was out there; and somewhere in the back of my mind, I'm sure that it still is. The article was amusing for me to read, and I was reminded of the many years throughout which I have played that game with family and friends. To be honest, despite my admitted sense of nostalgia where this game is concerned, I couldn't care less whether Hasbro decides to update the game tokens; this change will not affect how the game is played, and it might help to attract a new generation of players. I am certainly not one of those people who feels honor-bound to voice their opinion that everything should remain the way that it was in the past. However, there is one point that the article's author has completely missed: the playing piece in question is not a "shoe," it is a "boot," and the distinction - however small it may seem - is somewhat profound. A shoe is just that - nothing more. But the boot has a subtle, underlying meaning which most people do not see. When you look at the boot, it has a small loop on the back, which is called a "bootstrap." It is from this appendage on a boot that the English language obtains the word "bootstrapping," which means to "pull one's self up from their current position;" in other words, to take charge of your destiny and to make your life better. This is one of the main points in Monopoly; all of the players are attempting to pull themselves up from their common, humble beginnings, to build their respective real estate empires, and to crush their competition. The entire principle of the game of Monopoly is condensed into that single playing piece, and it represents one of the deepest metaphors in any board game. However, Hasbro might replace the boot with a T-Rex, which represents... um, let's see... a dinosaur... which is a metaphor for... well, I guess... nothing more than an old, dead, bird-like reptile. A Sailor said, "I'd step on it." A Soldier said, "I'd squash it with my boot." A Marine said, "I'd catch it, break the stinger off, and eat it." An Airman said, "I'd call the concierge desk and find out why there was a tent in my room." After the recent long-awaited and highly-anticipated death of Fidel Castro, I must admit that I was shocked at the number of "famous people" who were emanating never-ending streams of revisionist history drivel about Castro's many "accomplishments," while falling over themselves in futile attempts to outdo each other with undo praise for this despicable despot. Make no mistake - Castro was a terrible, wicked, horrible dictator who sent thousands of innocent people to their graves. 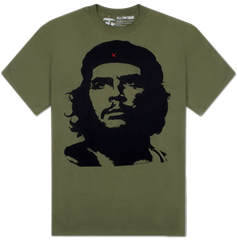 For those who are too stupid to know better, wearing a t-shirt like this in public is exactly like wearing a t-shirt with Adolf Hitler or Josef Stalin printed on it. The subject of this ridiculous memorial attire is Ernesto "Che" Guevara, who was one of the worst mass-murders in the 20th century. Countless multitudes of gullible and easily-swayed malcontents read books like Guevara's "Motorcycle Diaries," and they fall victim to his knee-jerk deceptions about how much he cared for the plight of the poor in South America. While I completely agree that the corruption in South American politics is pervasive and often horrific, most people do not realize that the terrors which were brought about by Guevara were far worse than anything about which he had complained. To put it mildly, Guevara was a spoiled, upper-class brat who became one of the worst mass murderers in Communism's long history of putting innocent people to death simply for having a college degree and/or being able to think for themselves. There are no two ways about it - if you lived in a country where Guevara had helped to overthrow your government, you simply would have been killed. No trial, no appeal - just executed. 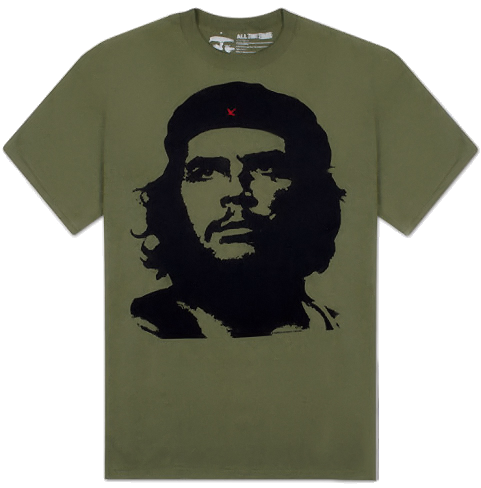 All of this is to say - there is nothing admirable about wearing a t-shirt with Guevara's faced printed on it; the only thing that it signifies is that the person wearing the shirt is an idiot. Dave Barry’s Year in Review: 2016 - What the ... ? Much has been written by others about the passing of Greg Lake yesterday, so pardon my addition to the fray. Greg Lake's death follows just nine months after his former band-mate, Keith Emerson, and these musicians were two-thirds of the colossal progressive rock band "Emerson, Lake & Palmer (ELP)." For those who aren't aware of who these guys were, ELP dominated the progressive rock scene throughout the 1970s, selling millions of records and filling stadiums with hundreds of thousands of fans during their International tours. PS - Since Emerson and Lake have both passed away within months of each other, someone needs to surround Carl Palmer in bubble wrap before something happens to him. Remember how I was running for President? Well, it turns out that I would have won both the electoral college in a landslide AND the popular vote if you deduct the millions of people who didn't actually vote for me.